To tighten your upper arm skin you can engage in regular exercises which are targeted at your triceps.Once your triceps muscles are enhanced the sagging skin will stretch out and be in harmony with your arm muscles and consequently it’s visibility will be reduced. 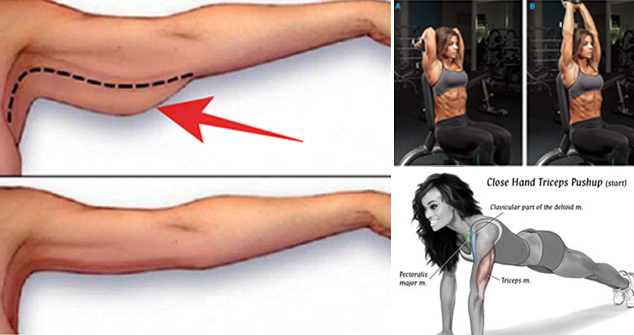 For this, you can try these three exercises today to reduce the sagging skin on your upper arm by tightening it. First get yourself in a push-up posture. Ensure that you align your body with your head and your hands are under your shoulders. Also you should apply pressure to your toes in this posture. You should then bend your elbows towards to floor and backwards to a 90 degree angle. Ensure that your body is straight always. Your arms will be extended completely only when you are pressed back. If you are not able to do regular pushups, you can try the knee pushups. Slowly bend your elbows to lower your body toward the floor until your elbows are at about a 90-degree angle. Be sure to keep your back close to the bench. Once you reach the bottom of the movement, press down into the bench to straighten your elbows, returning to the starting position. This completes one rep. Keep your shoulders down as you lower and raise your body. You can bend your legs to modify this exercise, if it’s too hard! Maintain a standing posture at first. Keep your feet at a shoulder-width apart and pick up a dumbbell in one of your hands. Raise the dumbbell over your head and fully extend both your hands in the process, while your palms are facing up. Let your forearms and biceps touch by you lowering the resistance in a semicircular motion to the back of your head. Keep your upper arms at close proximity to your head while your elbows are inward and perpendicular on the ground. Make sure you do not move your upper arm when engaging in this exercise. Move only your forearms, breathe in and raise the dumbbells with your triceps, then get back to your starting posture and exhale.